Innumerable films, books and plays have used the mental institution as a metaphor for society, one which challenges us to think about the faint line between sanity and insanity. The latest treatment of this theme is to be found in HOUSE OF FOOLS, a film by the Russian writer/director Andrei Konchalovsky, who is best known in this country for such works as Shy People, Homer & Eddie, Tango & Cash and Runaway Train. In his own land, Konchalovsky won plaudits for Siberiada, Ryaba, My Chicken and Uncle Vanya. Konchalovsky, who was born in Moscow in 1937, comes from a distinguished family of artists. He studied piano for twelve years, but after seeing Mikhail Kalatozishvili's 1957 film, The Cranes Are Flying, decided to swap the piano for a camera. 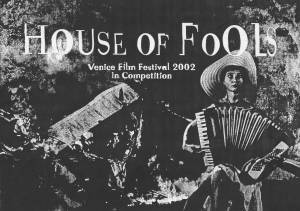 HOUSE OF FOOLS is based on a true story. In 1996, during the first Chechen war, the border region of Ingushetia was threatened with invasion by Chechen detachments. A psychiatric hospital on the Russian side of the border found itself under siege by the Chechyans. "The staff had left the hospital and the inmates spent five days alone," said Konchalovsky in an interview. "The newspaper report described how the patients organized themselves, how the sanest among them had taken over, how the meals had been organized, etc. Not one of them had left the hospital." Konchalovsky fictionalized the newspaper story, but filmed his treatment in a psychiatric clinic outside of Moscow. Julia Vysotsky, the remarkable young star of HOUSE OF FOOLS, spent two months with the inmates before shooting began. So well did she integrate herself into the small community that the inmates began calling her by her character's name, Janna. Many of the inmates played themselves in the film, with only a handful of professional actors taking on the more difficult roles. The atmosphere and workings of the clinic are conveyed with power and truth. In fact, so real are the first ten minutes of the film, when the camera takes us inside the clinic and introduces us to its inhabitants, that it is difficult, even painful to sit through them. Konchalovsky doesn't stint from showing us the severe problems of the patients, many of whom are disabled more by physical than psychiatric problems--blindness, paralysis, missing limbs, etc. They live in squalor and deprivation, fighting noisily for food and favors, but on the other hand they do belong to a family and manage to enjoy some of its strengths and benefits. Every night, for example, the inmates gather by a window to watch a long, brightly lit passenger train rumble by on an overhead railroad bridge. The sequence shot by Konchalovsky and his gifted cameraman Sergei Kozlov will remind many of the striking image in Fellini's Amarcord, when a huge cruise ship suddenly looms up in the night and glides by the small town in grand, fantastical fashion. There are many other Felliniesque touches in HOUSE OF FOOLS. Vysotsky's Anna is an homage to Juliet Massina in La Strada, a simple-minded waif whose sweetness and goodness triumph over the inhumanity of her circumstances. Janna, an inmate herself, uses her accordion to entertain and delight those around her. They may be freaks but Anna loves them all in her sweet, accepting way. Janna is a kind of holy fool, who keeps singing and playing even when war encroaches and the Chechyans shoot the place up because they believe Russian soldiers are hiding here. When the doctor and other staff flee, leaving the inmates to cope for themselves, it is Janna who keep things from descending into complete anarchy and disaster. The Chechyans and the Russians keep battling each other for control of the clinic and as they taken turns destroying it and each other, Janna keeps singing her songs of peace and love, and Konchalovsky's theme emerges more clearly. Mad as the inmates are, they are not anywhere near as cuckoo as the human race.